In 2016, I was introduced to a farmer in his mid-50’s who’s built a considerable portoflio of now debt-free farmland. He owns 3,000 acres of farmland that’s worth approximately $5,000 per acre (down from $8,000ish a couple years ago). How does a farmer accumulate 3,000 acres of debt-free farmland? I simply asked the producer, “How did you get in the financial position you are today?”. Those two factors definitely play a role in anyone who acheives financial success. I wanted to know more specifics. So after a couple hours of discussion here are many factors that I attribute to his success. There is one main behavior that I attribute most of his success to but I’ll touch on a few others first. Timing of purchases. Other than 160 acres purchased this year, he aquired this land 10+ years ago at an average land cost under $2,000/acre. It’s important to note that there was only 200 acres was family land that was purchased, at a slight discount to appraised value. A bit of luck here. A string of great crops from 2010-2013. This is where luck comes into play, specifically with how 2012 played out. The average farmer will experience one or two years in their careeer with great crops and great prices. 2012 was that year for this producer. Strategic decision to pre-pay debt. From 2010-2014, this producer prepaid approximately $500/acre of his land debt. Comfortable paying taxes. To pre-pay $500/acre in debt, you obviously have to pay a considerable amount in taxes. This producer told me, “that’s the cost of doing business and I think its highly unlikely taxes will be going down”. He could’ve updated his whole line of equipment and maximized his Section 179 depreciation during those years but he executed his goal of paying down his land debt. Ample grain storage. He told me he hasn’t had to dry one bushel of corn “in town” for over 20 years. He feels strongly this has added $.10-20 to his bottom line over time. See this post for the cost of on-farm vs. commercial drying. Seperating futures/basis. Since 2000, he’s seperated his futures and basis sales. While he doesn’t always get the best basis of the year, he’s experienced a number of home runs. He locked in $.50+ of basis appreciation on his 2010, 2011, and 2012 corn (vs. harvest values). Unemotional grain marketing. The day I met with this producer, November 2016 soybeans were trading north of $11.00. He told me he had already sold 50% of his APH for an average price of $9.95 futures. Rather than regretting his earlier sales, he told me he was excited to see the higher prices and was looking and at option strategies to protect the top 50% of his production. “I’m always long. Market rallies are great!” See this post where we discuss grain marketing being an emotional roller coaster. In my opinion, the key reason for this producers success is that he knows his numbers backwards and forwards. He could rattle of nearly all of his expenses for 2016 and 2015. On the day we met, he was looking at locking in fall urea and hedging some 2017 corn due to a favorable N/corn spread for his local area. He’s a numbers junkie who tracks everything in a series of spreadsheets. Note that this producer does not use our software. He has his own system that he’s put in place over the years. But producers like him are the reason we’ve built our product! I don’t think he realized it but by simply knowing his numbers, he can 1) make unemotional, profit-focused marketing decisions in an era where everyone has an opinion of future price (eg. throwing darts) and 2) he approached every agronomic/farm investment decision with a key focus on ROI. Futhermore, his goal of paying off his land by the age of 60 presented itself a few years early and he jumped on it. I should note that not everything is perfect. He had an ugly financial year in 2014 due to a poor crop (way too much rain) and he “didn’t make much” in 2015 due to an average crop with marginal prices. All-in-all, he can absorb some bumps in the road and keep doing what he loves becuase of his business-minded approach to farming. The key takeaway is that today’s producer needs to find a system that helps them make unemotional and profit-focused farm business decisions. 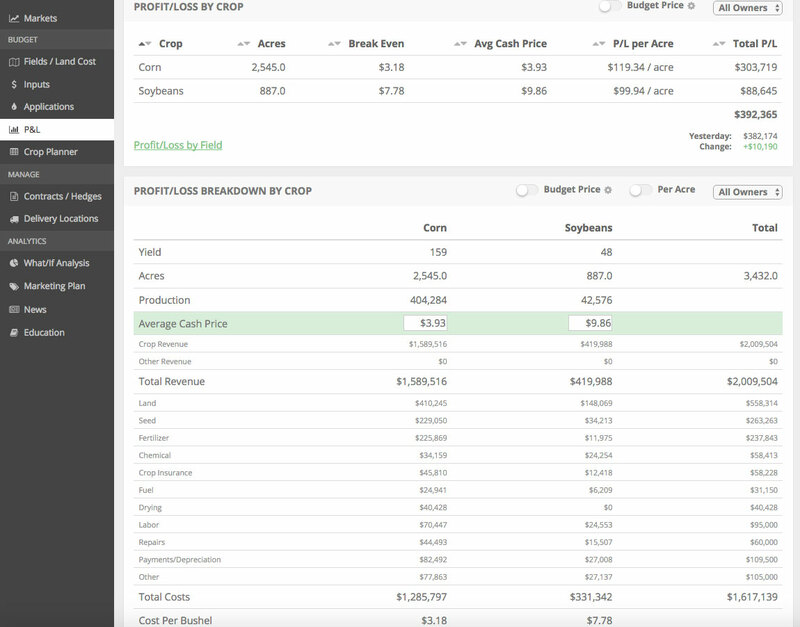 Whether that’s a series of spreadsheets, hiring a financial consultant, or using a software system like Harvest Profit (click below if you’d like a free demo), farmers should be making investments* in the business sides of their farming operations. Also, if you like content like this sign up for our weekly newsletter below.